Burbot is a fish that belongs to the family of cod. Its meat contains a lot of minerals and vitamins, in addition, it is quite greasy and tastes great. Burbot fry, stew and make him soup. Frying troublesome as it is necessary to constantly monitor the process of cooking and frying the meat loses some nutrients. Burbot meat is so fatty and juicy, the pieces can fall apart. So the best way of cooking cod is to bake it in the oven. This dish will have great taste and appetizing appearance. First cut the fish must be cleaned from the scales, but since the scales are quite small and set far back, you have to try to make it to clean off. If you do not want to mess with scales, you can just gently pull with fish skin. She removed the stocking from my head, around which the incision is made, and ending with the tail. Remember that you need not only how to wash but also to gut the fish. The inside should be learned so as not to damage your gall bladder, otherwise the meat can become bitter. From the head it is necessary to remove the gills, the very same head cut off is not necessary, as it is ready burbot will look impressive. After your fish is cleaned and gutted, it is necessary to remove excess moisture from the fish surface by blotting it with a napkin. Then we mix fine salt with ground black pepper and with this mixture to RUB the fish inside and out. Then let the fish stand for 30 minutes to absorb the salt. At this time, cut the vegetables. Peeled onions cut into rings, if the bulb is large, you can cut it in half. Grate on a coarse grater carrots. Greens finely chop. Stir and a little sunflower. Tomatoes cut in small cubes. Pan liberally grease with vegetable oil, and it put 2/3 mixture of onions, carrots and herbs. On the vegetables place the prepared fish, the belly of the fish put in the remaining vegetables and chopped tomatoes. Approximate cooking time at a temperature of 180 degrees Celsius is about 0.5 hours. Bake the dish need to until then, until browned top of the fish. 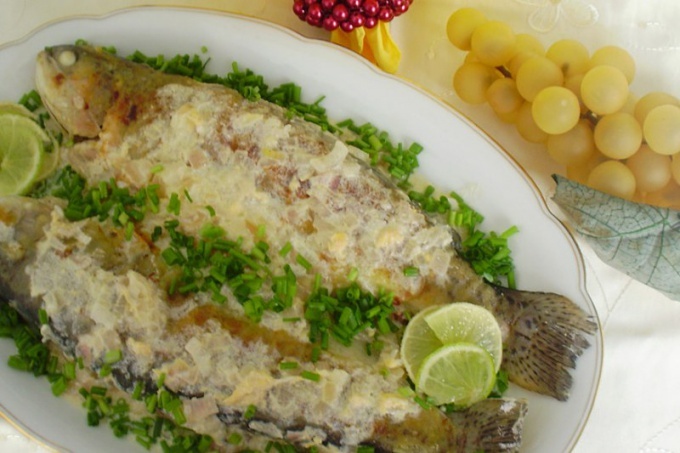 Prepared fish lay on a nice platter, garnish with fresh herbs. As a garnish perfectly suitable potatoes or rice. Recipes for cooking cod in the oven quite a lot. It can be prepared using foil or without it, combined with bacon, cream or eggs. Each dish has its unique taste. But the most successful and delicious is considered full, burbot, baked with vegetables.